It was useless - no start cold mornings (-1c) or evenings in the dark (4-6c). It ran at about 12.9:1 AFR last Saturday, but not very long. And no start today in 10c some sunshine. Cleaned all the carb passageways with carb cleaner and compressed air. Checked tank could breathe. Checked fuel in carb. Checked ignition wiring and spark plug cables. Checked for spark with a spare plug -it sparks. Tried the old Dignition unit just in case I had disturbed something. Tried some cold start spray and got a few exhaust bangs. Changed the spark plugs - which were very black. Instant start. Reasonable revving.Idles at 14.6 AFR( -ish). Refit the Amethyst ignition once engine warmed. Instant start, responsive revs. 14.6 to 15 AFR. Burnt the oily crud and carbon off the W5DTC plugs with a mini blowtorch and fine emery. They've not done many miles. I can only imagine that the small manoeuvres on the rich carb starter circuit and attempted starts were not enough to clean the plugs. time to convert to mpi? haha. The carbs did not fail on CO emissions. Time to mend the preheater, pass MOT, fit different air filters and larger chokes, maybe a longer duration camshaft. It appears to have higher exhaust valve lift too. Well yes. The plugs were fouled. But I only drained and refilled the fuel tank, replaced a x-relief relay, mended a foglight. So it was odd that it would not restart after a few months. End of November it drove to MOT, did not fail for emission, drove home fine. The starter circuit (DHLA) is calibrated right for richness and normally works. No evidence it is stuck on. I remember reading somewhere about "warm-up' plugs. Longer insulator for start phase in race engine. 'holler plugs' is probably a scan to text artefact from the Champion information sheet. "It is good practice to warm up a racing engine with hotter plugs. The warm plugs will assist the ignition and carburation to bring the engine up to proper operating temperature." "... use the warmest retracted gap heat range available in the line." My preheater fulfils the same purpose of making start easier. .
With one none working front fog-light. That would be a fail for a new car. Interesting. But saved me 10 quid for a bulb and 25 quid to fit it. I keep seeing people driving in the dark on just daytime running lights. DRL Surely a modern car full of electronics could detect it is dark and car moving and turn on the headlights. If its oiling its plugs when it sits for a while, I'd be wondering about the valve stem seals. Interesting idea. I built the big valve head in 2010 with Elring head set, but did not fit it until Aug 2016 (typical me). it's only done about 12,000 miles since then. I'd expect stem seals to last 100,000+ miles. I checked the valve clearances in that time, not sure when. Maybe the seals have hardened and split, but all 4? HC reading is about the same as in November, CO has reached 2%, but the carbs are now spotless inside. Can't see any blue smoke in the mirror when set off. I'll inspect the plugs again tomorrow. It's been instant start every time from cold and in the damp windy wet. No preheater. Set the heater control sliders to about two-thirds hot and fully at screen on fan speed 1. Pump accelerator 3 times, pull on the choke cable to move the pistons which open the starter circuits, turn key. Fires and runs. Drive away. Push the choke cable in after 100 feet or less, try to use the gears to keep engine at 2000 to 2500 revs for first mile. It's not stalled or misbehaved. Change heater slider to full heat if cold weather or nearly off in warm weather once temp needle. moves out of the first eighth. Don't thrash engine until needle leaves first quadrant, about 3 miles. With the preheater that would take max 1.5 miles and the interior would be pleasant.. It's not stalled or misbehaved﻿﻿﻿﻿. Famous last words. 2 days driving on 12 litres of fuel no problems.. Put 20 litres in the tank. Drove 10 miles, parked. Started again after a day in a car park. Drove home - loses power after 5 miles. It'll do 25mph or 50mph but at speeds in between were awful, stuttery. Sounds like noisy misfire. AFR gauge says lean. New spark plugs are white of lean - no trace of oil. Does the tank breather off the fuel neck thin tap point have a directional one way valve? Could the tank be emptying of fuel, but not getting air to replace it so pump can't fill the carb wells? Might the breather just be blocked? Haynes page 55 shows 2) a Gravity valve (not all countries). I don't have one of those. which has something part way along it. If the something is a one-way valve and I've swapped the tubes to the filler neck that could explain it. not a tiny see through plastic thing. I had drained the tank using the fuel pump, sucking 9 years of crud from the very bottom of the tank through this. Removed it shook it and black bits fell out of it. Blew threw it backwards until got a nice misty petrol spray out of the intake nozzle then just air.. So that would explain difficulty starting after standing, and leaning out under larger flow, but sufficient to cruise. Might even explain lack of top-end grunt. Just to be sure I've experimentally fitted a gigantic injection filter 1J0201511a (82mm diameter)with 8mm tails. Turned ignition on and got a good deal of pump activity half-filling the filter? and carb wells until needle valves shut off. Will see how that starts and runs tomorrow. Good for 10 miles, but went lean on the way home. water? and some more dirt in the fuel. I assume rain dripped in the filler neck holes. Also the fuel on top is slightly yellow, but petrol is normally clear? Phase separated Momentum99 which has ethanol for the extra octane? Might draw off the bottom layer and see if it burns. Is the filter at an angle - it could be it was just collected at the outlet with mostly water going into the fuel line creating the bad running. suspect you need to drain the tank down to make sure no more water is in there - how is it getting in?? Siphoned off the petrol from above. Poured it back in the tank. No hiss when opened the petrol cap. Think some dirt must have been in the tube from tank to filter and some water in the tank from filler neck pinholes before repair . Even inverted tank does not drain completely because pick up tubes and breather tubes and fill neck tube all protrude inside. Didn't want to remove level sender as would need new o-ring and the white plastic looks like it may be too brittle to open by unscrewing with crossed screwdrivers. Siphoned the hose from pump to carbs, siphoned both float bowls , replaced both carb mounted banjo inlet filters which had caught some very small black crud. Pipe rubber? Don't think it any lumps can have entered the carbs. Maybe very fine silt. Still lean, so cleaned the vacuum take off tubes, and lastly the 4 mixture screws, which were a bit grubby, and blasted those with carb cleaner and keyboard duster spray. Must be the smallest hole with strongest suction when close the throttle. Think that has done it. Set mixture using the AFR gauge to around 14.9. Need to reset the mixture properly with engine fully warmed using vac gauges and then drive 10+ miles. But it sounds far better at low speed pickup. Not quite sorted, I think fast cornering sucked some more water up after 24 uneventful gentle miles. Ordered a water separating filter funnel, some Isopropanol and got some Seafoam SF16 today. maybe siphon out through level sender hole, then finally clean with Seafoam. Glad I've got some bigger carb jets to run on alcohol. Pumped out through the inline filter, and the magic water separating funnel into 2 reserve cans and a wine bottle 😃. Lifted and tilted the back of the car until nothing more would pump out. 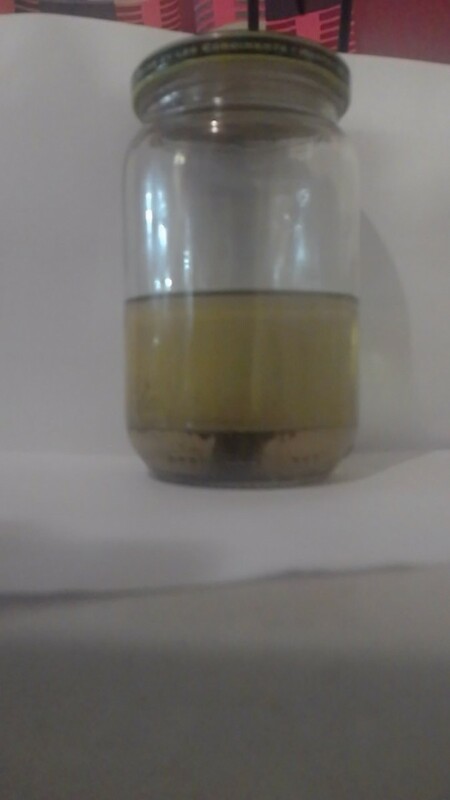 Only a tiny amount of water found at bottom of the bottle after resting for 15 mins. Poured 1/4 litre isopropanol in the tank. Siphoned out the carb fuel bowls. Drained the filter, added about 2 litres of clean petrol back to tank. Tipped car left and right. Drained big fuel filter and half-filled it with Seafoam using a siphon pump. Pumped into carb wells and let sit for 4 hours. Started and ran for 30 seconds to let Seafoam reach carb passages, and got some white smoke out of the carb trumpets! Added more clean petrol back to tank. Started - no smoke, steam or scary noises and adjusted mixture for smooth running and 14.5 ish AFR. Checked with vacuum gauge and found #1 cylinder did not have as much suction as the other 3 cylinders. Investigated idle screw and found the spring and washer, one good condition o-ring and a hard flattened one that would not seal around the shaft. Normally the idle screw and spring assembly comes out as a unit. That flattened o-ring must be ancient. Wonder if it was letting air past once I had super cleaned the carb. Messed with the left right balance a tad. Going to let Seafoam do some overnight deep cleanse. Think I'll check and adjust the bypass screws using differential manometer ($1.55 synch tool). Very hard to start with ice on the car and no preheater. Chucked 1/6th litre isopropanol in the tank along with 5 litres of petrol from a reserve can. Started drove, but a bit rough. and main circuit all fine..
Recleaned number 1's carb idle passages with carb cleaner and compressed air backwards from progression hole cover to removed idle jet. Double checked the idle jet and its holder. No emulsified fuel blockage. Went to reattach vacuum gauges to the vac take-off points. I use threaded 0.5mm welding tips, silicone hose and plug with golf tees - to discover that number 1 wobbled. Screwed it in tight, smoothed out idle and pick-up. I reckon the vac-take-off point is under high suction with nearly closed throttle, air leaks in at atmospheric so not as much fuel is pulled from the well. Some leakage might even spread along the balance tube to other cylinders which is post throttle plates. But the snubber on the vac gauge line means I can't see the tell-tale drop. I suspect the manifold vac driven Amethyst ignition does see the drop outs at low revs..
Weird - went lean again at light load. Cylinder 1 and 2 now both not running hot enough like 80c at exhaust manifold but 230c for 3 and 4. Wonder if the needle valve to that carb is blocked. There was some fuel in the jets though. Hope I can sort it get to Aldon RR tomorrow.